Red, as most of us know is the color associated with passion, desire, and love (we are going to assume for one day that we do not know the other emotions associated with red), therefore, its predominance on Valentine’s Day. So Pra’s choice is obvious. 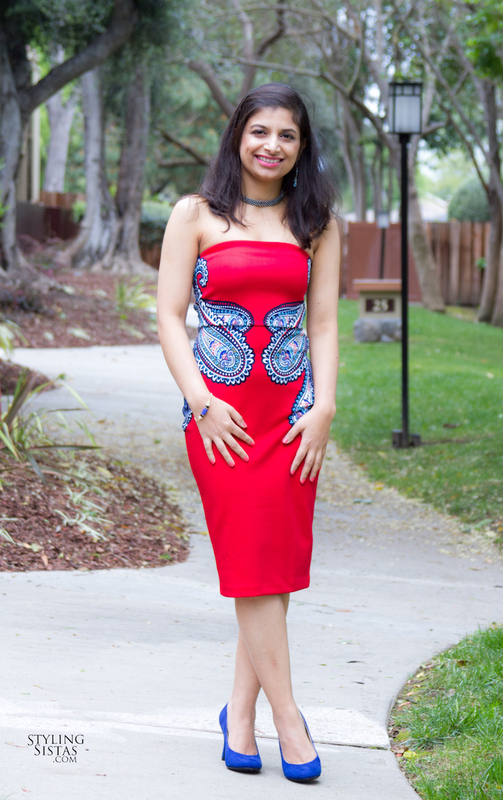 But many of us do not know the history of the paisley print on the dress that makes the dress stand out amidst red colored dresses. The paisley design originated in Persia, made popular by handwoven Kashmir shawls, but the name paisley to identity this mango shaped motif came about hundreds of years later. Paisley is a little textile town in Scotland where the design was first used on hand and Jacquard looms to produce multicolored paisley patterns on shawls. A quick Wiki search throws light on how this popular pattern has woven the Middle East, East and the West together, yet again since centuries. Our common human history always points at the progress that are collectively made when people from far away lands appreciate each other’s artistic expressions and incorporate that into their own creative endeavors to produce novelties that will stand the test of time. The voyage of the paisley print is one such saga, that transcended in form, kind, and continents through the ages. It’s connection to the Indian subcontinent intrigued the Styling Sistas, who have a strong evidential Indian roots  . Read more here and here.